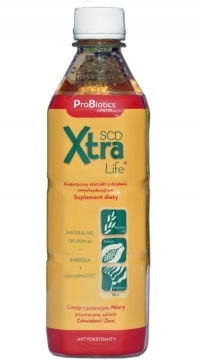 Esencja ProBiotyczna® (Essential Probiotics®) is manufactured in a process of fermenting a composition of several strains of probiotic microorganisms and contains the metabolites of these microorganisms. The beneficial microorganisms selected for the composition are commonly found in nature and are not genetically modified. of the microflora in the digestive ecosystem. 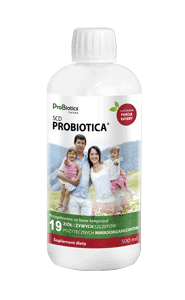 As a result of natural processes occurring in Esencja ProBiotyczna® (Essential Probiotics®), slight changes in color, smell and taste may occur as well as ingredient settling on the bottom of the bottle and a white layer on the surface. This does not influence the effectiveness of the product. Purified and structured, unchlorinated water, organic sugar cane molasses, SCD probiotic cultures, juice concentrates (blueberry, cherry, pomegranate).